Explore idyllic St Lucia where you can marvel at the dramatic peaks of the Pitons, before Royal Clipper meets up with Star Flyer and they both sail together to Cabrits. Discover the volcanic island of Dominica, before cruising to Antigua, home to the historic Nelson's Dockyard. Stroll around Basseterre, the capital of St Kitts which boasts magnificent Georgian architecture and Brimstone Hill Fortress, a UNESCO World Heritage Site. Explore the idyllic Iles des Saintes, a chain of eight picturesque islands before cruising to Fort-de-France, the chic capital of Martinique and vibrant Bridgetown in Barbados, where this fascinating voyage comes to an end. Embark Royal Clipper in Bridgetown, Barbados. St Lucia has everything required for relaxation - tropical flowers, rainforest and the dramatic peaks of the Pitons. Laze on the lovely beaches of Anse de Sable and Cas en Bas, and in Rodney Bay see the brig Unicorn, used in the film 'Pirates of the Caribbean'. Whales are often seen off the coast. Royal Clipper will meet up with Star Flyer today and they will sail together to Cabrits. Cabrits National Park in northern Dominica includes tropical forest, walking trails and the remains of a volcanic crater. Perhaps glide through a steamy orchid-festooned rainforest on a fascinating boat ride, hike to breathtaking Trafalgar Falls and a bubbling lake, or explore the restored English garrison of Fort Shirley, built in 1778. Falmouth Harbour on the lovely island of Antigua is close to the historic Nelson's Dockyard. Stroll the shops, or dine in one of the excellent local restaurants. 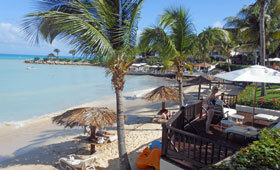 Carlisle Bay on the south coast is a gorgeous palm-backed beach with a usually-calm sea and fine white sands. This is St Kitts' capital, set against rich green hills with Georgian architecture and The Circus, a miniature version of Piccadilly. St Kitt's narrow-gauge railway is the last in the West Indies, taking tourists on a scenic journey round the island from Basseterre. Walkers can see Trumpet Trees, mongoose and green monkeys, or climb up to the 17th century fort at Brimstone Hill. Later, relax on the beach at South Friars Bay. Iles de Saintes consists of eight tiny islands. Only two are populated and Terre-de-Haut has a leisurely, French atmosphere. This charming island is only three miles long, best explored on foot or by scooter, and the small village of Bourg has brightly painted houses. For swimming and snorkelling, Pain de Sucre is a favourite spot. Martinique is a beautiful island. Fort-de-France is the chic capital and boasts narrow lanes and the tranquil park of Savane. Josephine Bonaparte was born here and a statue of her stands in the harbour. Although Martinique has a French flavour, the island has strong Creole traditions. Spend the day relaxing on one of the stunning beaches.